Corporate Ownership: Central Boca Chica, Inc.
On May 14, 1845, when a water right to use water from the Jacaguas River for irrigation purposes was granted, Hacienda Boca Chica was owned by José Hemeterio Cabrera (1810-1860). In 1872 it was owned by his son Gustavo Cabrera Rosaly and later the firm Cabrera Hnos. who was granted a similar water right on October 1, 1878. 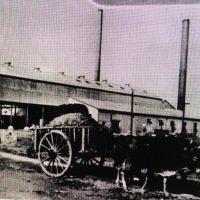 In 1903 Boca Chica was acquired and converted into a Central sugar mill by Spanish immigrant from Sóller Damián Morell Bauzá (1871-1943) who was married to Maria Cabrera Castillo y Veitia, daughter of Enrique Cabrera Rosaly (1850-1899). Its overall production trend was upward until reaching its best year in 1938 when a downward trend started. 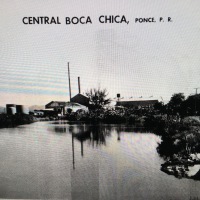 In 1933 Central Boca Chica, Inc. was acquired by Wirshing & Cia. S en C, whose Directors at the time were cousins Armando O. Wirshing Serrallés (1912-1983) and Juan Eugenio Serrallés Sanchez (1908-1967) with Damian Morell as Manager. On May 4, 1946 Wirshing & Cia. S en C. sold all of Boca Chica's machinery and equipment to Rodolfo Matamoros Arias of Mexico City for $500,000 which price was later increased to $600,000. On June 17, 1946 the purchase contract was transferred by Matamoros Arias to Azucarera del Centro S. A. which transfer resulted in a case decided by the Supreme Court of New York. The Wirshing and the Serrallés families also owned the nearby Central Mercedita. Central Boca Chica sugar mill has no relation to Boca Chica Sugar Mill in the Dominican Republic. Boca Chica Puerto Rican Rum is still distilled today by the Serrallés Distillery in Ponce and has no relationship to Boca Chica rum distilled in the Dominican Republic and sold mainly in Europe. Today, the land where the sugar mill was located and the surrounding land is owned by by the Sucn. J. Serrallés and is being used to grow mangoes.